I accepted samples from All Natural Soap. Their soaps are free from synthetic ingredients like SLS/SLES, parabens, petrochemicals, palm oil, artificial colours and fragrances and animal products. Soaps are made by hand using the ‘cold-process’ method and suitable for vegetarians and vegans (the exception is Goats Milk soap). As you all know I have extremely sensitive skin so All Natural Soaps sent me their most popular unscented soaps. I received Shea Luxury, Goats Milk and Calendula, Coco Castile (the heart shaped soap) and two delicately scented varieties Lavender & Rosemary and Avocado & Cedarwood. A soapourri bag was also included containing shreds of soap. For the last couple of weeks Shea Luxury and Lavender & Rosemary have been side by side in the soap dish in my bathroom. As you know I am a huge fan of shea butter so have been enjoying using this soap. As we head into Autumn the weather takes its toll on my hands so I am always looking to replace moisture. I am very happy to report that Shea Luxury appears to keep my hands nice and soft. Of course I still apply hand creams but I certainly do not notice any tightness immediately after washing. Most importantly I have not experienced any noticeable irritation on my skin. The same goes for the Lavender & Rosemary. I have yet to try the other soaps so will have to report back at a later stage. I am certainly very impressed with the quality. These haven't turned to mush in the soap dish. Even though these are only samples there was attention to detail with the packaging which was a nice touch. 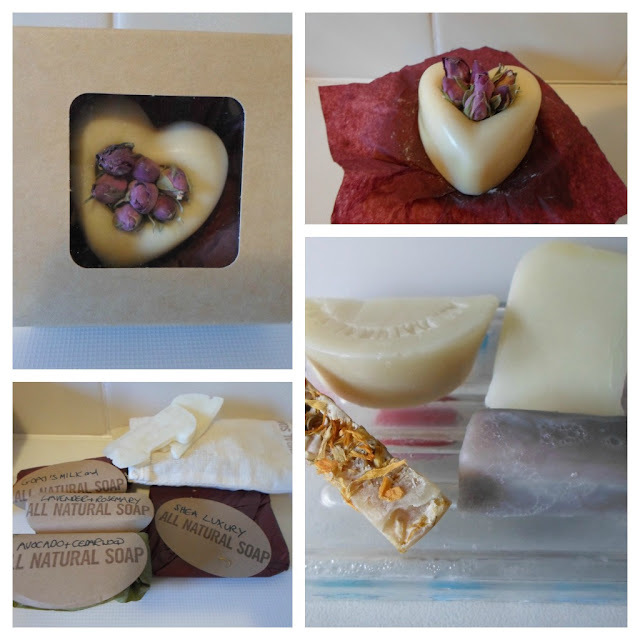 I recommend you take time to browse the website as All Natural Soaps offers a wide variety of soaps including a bespoke service. I love the idea of having heart shape soaps for Wedding or party favours. The gift boxes are beautiful and definitely worth considering now we are all counting down to when Santa visits. Disclaimer - PR Samples, links are not affiliated, 100% my own opinions after testing products. these soaps look so beautiful! I know I wouldn't use them as they're so pretty I wouldn't want to spoil them! Let me know if you try it I have certainly enjoyed using it. So glad to hear they're working so well for you Sarah :) and Maddy, if you don't want to use them no worries as they work very well as little decorations and also room fragrancers - particularly the decorated varieties.